The grilled vegetable sandwich is perfect for those who are vegetarian, but still love grilled meals!The total preparation time for the sandwiches is 30 minutes, and grilling time is 20 minutes. 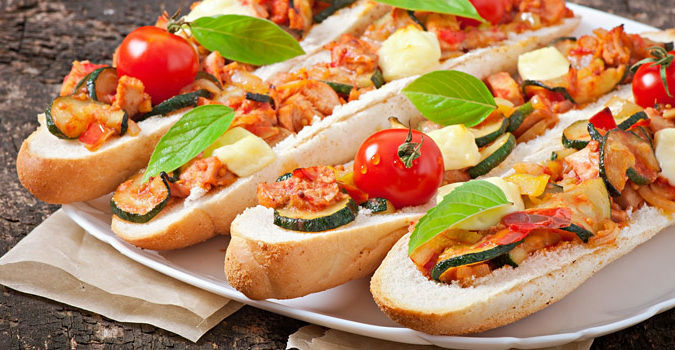 The ingredients include 2 focaccia bread pieces,2 red bell peppers, 1 zucchini, 1 yellow squash, 1 red onion, 3 cloves of minced garlic, ½ cup crumbled feta cheese, 1/4 cup of mayonnaise, 1/8 cup of olive oil, and 1 tablespoon of lemon juice.The amount of ingredients will be good for two sandwiches or two servings. As mentioned, the recipe makes use of focaccia bread, feta cheese, and red bell peppers, zucchini, yellow squash and red onions. However, feel free to mix it up. You can try it with other kinds of bread such as multi-grain rolls, other kinds of cheese, and other vegetables like green bell peppers and eggplant. Put the mayonnaise, lemon juice and minced garlic in a bowl. Mix well, and set aside inside the refrigerator. This will serve as the sandwich spread later on. Preheat the grill for high heat, and brush olive oil on the grill grates. Slice the bell peppers, zucchini, yellow squash and red onion. Also brush olive oil on each side of the vegetable slices. Put the vegetables in the grill. The bell peppers may take longer to cook so make sure to place them near the middle of the grill. Cook for about 3 minutes. Then, turn each of the vegetables, and cook for another 3 minutes. Afterwards, remove all of the vegetables from the grill and set aside. Now, take the mayonnaise mixture out from the refrigerator. Spread it on one side of each bread pieces. Sprinkle the crumbled feta cheese. Put the bread pieces on the grill for about 2 to 3 minutes. This will be enough to heat the bread as well as to melt the cheese. Remove the bread pieces from the grill, and top it with the grilled vegetables. Voila! Grilled vegetable sandwiches to make anyone’s mouth water.